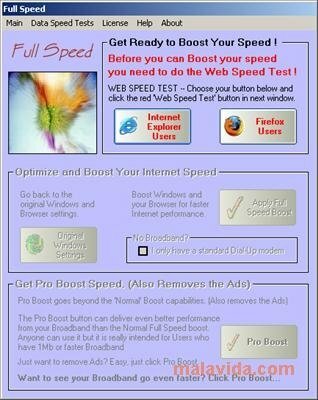 Full Speed manages to achieve a spectacular increase of the speed of any broadband connection and to obtain a brilliant improvement in the download speed performance. It can increase the general performance of our Internet Explorer and Mozilla Firefox browsers up to 500 per cent, maintaining the quality of the original websites. The majority of Internet browsers don't make the most of the full network speed. With the help of this tool not only will you be able to manage a quicker general access, we'll also notice improvements in all the aspects related with the Internet. You'll notice it in the download speeds, that are quicker, in a better performance of the website browser and music and film streams. Full Speed manages that the download times decreases, as well as improving how fast graphics and websites are loaded. Full Speed is extremely easy to use: all you have to do is press a button and everything will be carried out automatically and for ever. It also improves the speed for Remote Desktop and VPN sessions, even managing to increase the speed of an offices intranet network. It has tools to perform speed tests, both for Internet Explorer as well as for Firefox, that we have to install previously. By comparing the results before and after activating the acceleration, we will be able to check how effective this tool is. An Internet accelerator that really manages to make the most of all the power of our broadband.